Holds two (2) 5′′ (127mm) dia. rolls of 1500 sheets or standard toilet paper rolls and includes a 5″ x 18″ (127mm x 457mm) stainless steel shelf with 5/8″ (16 mm) hemmed lip on front edge. 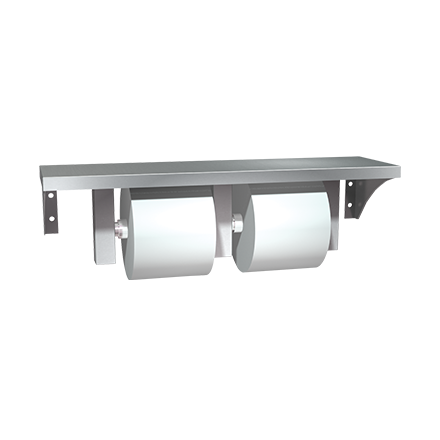 Rollers molded of high impact-resistant polystyrene plastic and two (2) are supplied. Toilet paper rolls are self-feeding on user-pull demand until supply is depleted. Rollers are spring loaded and are free-rolling.